Pegler Yorkshire has once again highlighted how it can help installers deliver a fast and efficient installation with its support of Fusion Heating at a project in Comber. The conversion from Economy 7 to gas heating at Stepping Stones sheltered housing scheme is the perfect illustration of the all-encompassing product range offered by Pegler Yorkshire that can meet varying demands. Fusion Heating used the new Tectite Flexible Metal alongside Tectite Classic fittings and also XPress Carbon on the project which involved the replacement of the existing Economy 7 heating with a new gas-fired boiler system. All this had to be achieved while the home was fully operational. Stepping Stones, which is operated by Alpha Housing, includes 27 onebedroom, self-contained flats, a common room, kitchen, hairdressing salon, a shower room and a launderette, all of which require adequate heating. The advantages of using Pegler Yorkshire products are many but, in particular, the innovations offered by Tectite Flexible Metal and Tectite Classic led to a faster, more efficient installation. These advantages are centred not only on the push-fit connection but also the heat-free aspect. These can be translated into cost savings through less COSHH controls, no hot work permits, no specialist tools, lower insurance premiums and labour time savings. According to Alan Taylor, Installation Manager at Fusion Heating, these many benefits made it perfect for the project. “We trialled the Pegler Yorkshire range at a similar project in Portadown but the fact that we have turned to the company again speaks volumes about how we rate it,” said Alan. “The training provided by Pegler Yorkshire was very thorough but straightforward and our engineers found the products extremely easy to work with.” The fact that the Tectite and XPress products do not require hot works was another major benefit for Fusion Heating. “That is one of the huge attractions for us,” added Alan. “You are working in a fully operational home, so time is of the essence, as is safety. 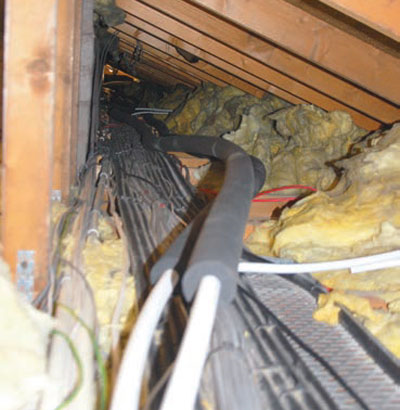 We were also working in some very confined spaces, in particular, the attic, so the flexibility and durability of the Pegler Yorkshire products, combined with no requirement for hot works, make, life so much easier and the entire job fast and efficient. George McGuire, Areas Sales Manager, Pegler Yorkshire, explained that more and more installers are enjoying the advantages of working with the company. 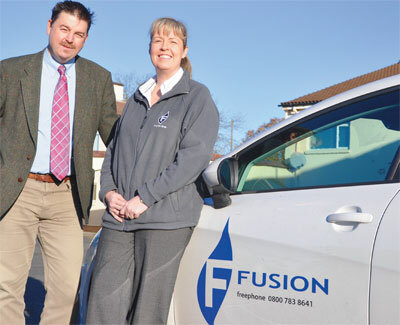 “We are delighted to be working with Fusion Heating again and they deserve credit for their forward-thinking philosophy,” he said. “Tectite Classic and Tectite Flexible Metal are all about creating a faster installation while still delivering reliability, and this project is the perfect reflection of this in action. Tectite Classic is part of this successful range and Fusion Heating completed the first installation in Northern Ireland using this product at Quarry Gardens Residential Home, Portadown in early 2013, emphasising the real benefits of the push-fit system. The same can be said for the use of the new Tectite Flexible Metal, which was launched in July 2013 to solve the dilemmas experienced by installers and specifiers seeking the flexibility, efficiency and swift installation offered by a plastic plumbing solution with the performance and reliability offered by traditional soldered copper. At Stepping Stones, the engineers were impressed by the fact that the tube could be worked by hand into incredibly tight bends, enabling a reduction in elbows and couplers. These bends are maintained while the system is also designed to significantly reduce blow-outs.